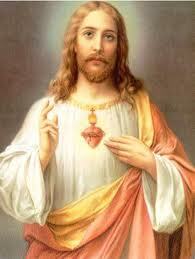 Rahul's Blog and collections: A Day with Christ! It was year when the world was transitioning into a new century! New hopes, new visions and new aspirations were in the air. I got an opportunity to travel to the holiest of the holy place, Jerusalem! It was also a very pious year for the devout Christians to visit the birth place of Lord Jesus!. On a Saturday morning when it was bright and sunny we headed to Bethlehem, the birth place of Jesus! It is located south of Jerusalem, almost 8 km away on the West bank in Palestine. We crossed the military outposts which are located around the area separating the state of Israel with Palestine. Luckily there was no requirement for other travel documents to enter the area under control of Palestine liberation authority. There is a transition, as the air suddenly becomes uncertain due years of fragile peace between the two countries, from an area of prosperity to one of basic livelihood, from lush and supple to one which is just very ordinary! The striking difference is too apparent! There is very little vegetation and the place is sparsely populated, just about 30000 people. The main source of income for the local populace is the tourists who visit ‘The Church of Naitivity’. 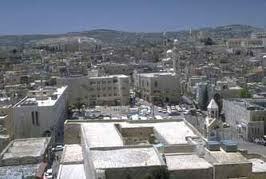 In the center of Bethlehem is its old city. 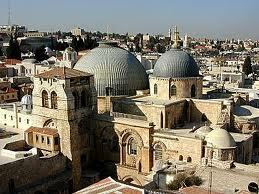 The old city consists of eight quarters, laid out in a mosaic style, forming the area around the Manger Square. The Church of the Nativity is one of Bethlehem's major tourist attractions and a magnet for Christian pilgrims. It stands in the center of the city — a part of the Manger Square — over a grotto or cave called the Holy Crypt, where Jesus supposedly was born. A silver star, beneath the altar in the Grotto of the Nativity, marks the spot believed to be the Birthplace of Jesus. The structure is actually a combination of two churches, the main Basilica of the Nativity maintained by the Greek Orthodox church and the adjoining Church of St. Catherine, the Roman Catholic Church,. There was a feeling of elation to see the place where Lord Jesus was born and there were many other tourists like us who stood equally awed by the place! It is a feeling difficult to describe to see a place which till hitherto I had read only in books. Our next destination was to see the place where Lord Jesus was crucified. We returned back through the arid zone which has a Mediterranean climate to Jerusalem. An hour’s drive brought us to the place. The oldest part of the city was settled in the 4th millennium BCE, making Jerusalem one of the oldest cities in the world. The old walled city, a World Heritage site, has been traditionally divided into four quarters, although the names used today—the Armenian, Christian, Jewish, and Muslim Quarters. While going around the Old City on foot, one can experience all these cultures in vicinity of each other. The place is a cauldron of major cultures and religious sentiments attached. The traditional site of crucification, is inside the Church of the Holy Sepulchre in the Christian Quarter of the Old City, has been attested since the 4th century. A second site (commonly referred to as Gordon’s Calvary), located further north of the Old City near a place popularly called the Garden Tomb, has been promoted since the 19th century, mostly by Protestants. Just inside the entrance is The Stone of Anointing, also known as The Stone of Unction, which tradition claims to be the spot where Jesus' body was prepared for burial. I had goose pimps when I touched the stone at the thought of Lord Jesus who lay here centuries ago on the holy cross! I wish all the readers a merry Christmas! thanks 4 sharing such nice information..
wonderful post...merry christmas to you! Wishing you and yours a joyful season! nice...ihope to one day visit myself...merry christmas! Is there any city in the world that you haven't visited? Merry Christmas to you and your family Rahulji. I have been wanting to visit Bethlehem since I was five. One day!!! @ Zuzana- It was nice to come across your blog in this year! Merry Christmas! @ Kalai- Thanks for liking! @ Francesca- Thanks! Merry Xmas! @ PhilO- You sure will visit! :) Merry Christmas..
@ Shreya-m My best wishes for all your dreams to come true! Merry Christmas..
@ Sujatha- Yes was lucky to see the place! @ Ashok- Thanks! Merry Christmas..
Wishing you and yours a great new year . @ Thanks Kavita, Wishing you the same! You have been to an amazing number of places. You are so lucky, my friend. @ Megha- Thanks a lot for liking! Merry Christmas! @ Rachna- I consider myself blessed to have seen a bit! :)Thanks Rachna for liking..
Dear Rahul, wishing you much happiness at Christmas and throughout the New Year. Very beautiful post. Nice to hear that you have been to Bethlehem. I hope to visit sometime. Vow! U got a great opportunity. U r indeed blessed. Will try to b there more often for such great info! @ Dianne- Good to see you back again! Best wishes fior the New Year..
@ Mani- So nice to see you again! Yes I consider myself blessed! Happy New Year to you! TBB- Chintan- You found the most sensitive part of the write up:)Wish you and your family tons of happiness, a huge following of your blog and all your wishes coming true in the New Year! Hi Rahul, hope that you and your family have had a wonderful Christmas, and wishing that the rest of your holidays are restful and incredible too! Thanks Sam! Wishing you a very Merry Christmas, belated and a Happy New Year. Hope you bring in more interesting news like always in your lovely blog! very lucky to have visited that place! thanks for sharing the description..and natural habitat. Thanks Harman, for your nice comment. Wishing you and your family a happy New Year! Hope you have a nice time between Christmas and New Year!